All transactions are safe and secure with a reliable history in online purchasing behind each of our associates. 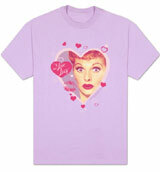 Buy the Lucy Hearts and Kisses t-shirt to own I Love Lucy clothing and merchandise. Lucille Ball has stolen our hearts with her natural beauty and hysterical antics. This light purple tee features Lucy surrounded by the hearts she has captured throughout the years and a kiss to let us know she loves us too. Lucy's fans always meant the world to her and she would do anything to give them a chuckle. Show the world that you love her too with one of these I Love Lucy tees. In addition to the Lucy Hearts and Kisses tee above, browse the I Love Lucy Clothing Gallery for more apparel like men's and women's clothes, kids shirts or hoodies.